The Long Sleep is an oddity amongst UFO stories – as it’s able to be dated quite specifically. We’re told that ten years have elapsed since Straker accidentally knocked down Catherine (Tessa Wyatt) and that it happened in 1974. So the present day events occur in 1984. After Catherine was hit by Straker’s car, she’s remained in a coma, until now. Just before she lost consciousness she mentioned flying saucers, so her case-file is reactivated now that she’s woken up. Straker feels a sense of responsibility, even though there was no way he could have avoided the collision, so he visits her in hospital to hear her story. Ten years ago, Catherine had run away from home and met up with Tim (Christian Roberts). The two of them then hitched a lift into the country and found a place to sleep – a deserted farmhouse. Tim offered Catherine a couple of pills, promising her that they weren’t addictive. But what occurred was a trip that was certainly bad for both of them. One of the most striking things about the flashback scenes is that up until they take the drugs, all of the action set in 1974 is sepia toned. Once they’re under the influence, there’s a sudden explosion of colour and everything slows down slightly – which effectively indicates the effects of the trip. Things take a turn for the worse when they discover two aliens in the farmhouse’s basement, doing something with a strange object. In their altered state, Catherine and Tim don’t realise the danger they’re in and they take part of the alien’s device. Still under the influence of the drugs, Tim jumps off the roof and is apparently dead, whilst the aliens attack Catherine. When she wakes up, the picture has turned back to sepia, indicating that the trip is over. Dazed and confused, she sees the aliens drag Tim away and she staggers out of the farmhouse. After an encounter with a truck driver who clearly had unhonourable intentions, she runs away from him and is mown down by Straker’s car. Her story of the alien’s device is enough to convince Straker that it was a bomb. This is a little bit of a leap, it has to be said. Another unanswered question is why they haven’t come back to prime the bomb or replace it with another one. What convinces Straker that it is a bomb is the time-frame – several days before Catherine’s accident there was an Earthquake in Turkey which killed 80,000 people. 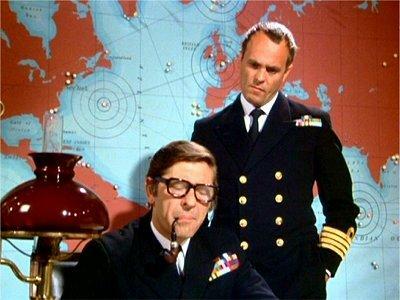 Straker’s convinced that the Earthquake was caused by an alien bomb, and that there’s a similar device in England, waiting to do the same. Again, this requires something of a leap of faith and also poses the question as to why the aliens wish to destroy large parts of the Earth, something they’ve previously never done (with the exception of Destruction). Catherine is more than a little surprised to be visited in hospital by Tim, who, like her, doesn’t look a day older. Quickly, it becomes obvious that he’s under the control of the aliens and he injects her with drugs in order to discover where she hid the bomb’s priming device. This then leads to a final example of Straker’s ruthless side, when he elects to inject her with the same drug so that they can discover the hiding place and attempt to get there before Tim. Dr Jackson warns of the dangers to Catherine, but as so often before, Straker has to weigh one life against possibly losing thousands. Tim is caught, the bomb is dealt with, but there’s no happy ending for Catherine. It’s perhaps fitting that the last recorded episode of UFO ends with a shot of an anguished Ed Straker. Once again he’s protected countless people, but in order to achieve this, sacrifices have had to be made. And that’s it – the 26th and final episode. If you’ve never seen it, UFO is a series that has plenty to recommend it. There’s the odd episode that doesn’t work and some do have gaping plot holes, but the main cast are excellent and the model-work (supervised by Derek Meddings) is never less than first rate. Let’s sign off with the Power Themes 90 remix of Barry Gray’s UFO theme. Mindbender might be my favourite UFO episode. It’s certainly the most daring, as it comprehensively breaks the fourth wall. A UFO crashes on the Moon and astronaut Andy Conroy (Al Mancini) retrieves a strange rock from the wreckage. Once back at Moonbase, he starts to lose his grip on reality. He’s an avid fan of Westerns, which may explain why he sees all of his colleagues turn into Mexican bandits. 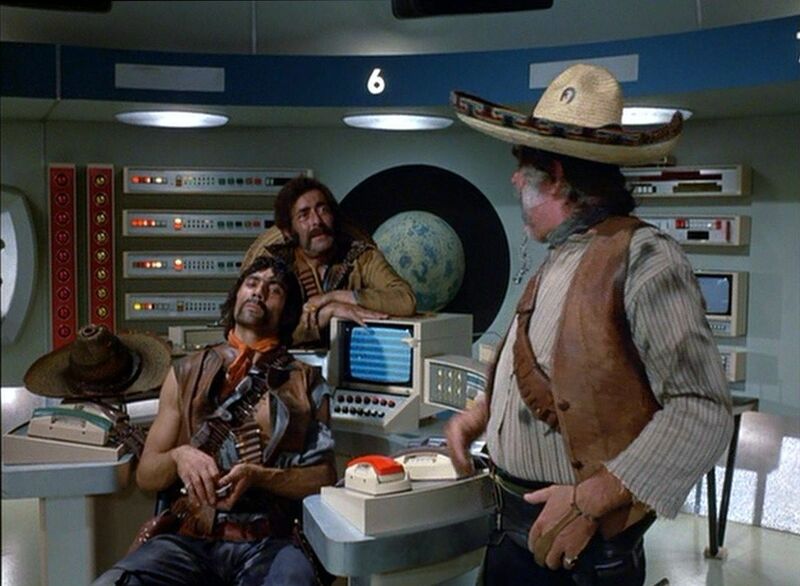 Initially, he sees the bandits roaming Moonbase, which is odd enough but as he descends further into madness, to him Moonbase has become a dangerous Mexican town full of outlaws who he has to fight to the death. During the scenes both Ken Turner’s direction and Barry Gray’s music offer numerous nods to the Spaghetti Westerns so beloved by Conroy. UFO is the last place you’d expect to see a Western (except on the back-lot) and it’s this juxtaposition which is so startling. Conroy is killed, but the mystery behind his madness remains unsolved. The rock ends up back at SHADO HQ where it infects Beaver James (Charles Tingwell) who becomes convinced that SHADO has been infiltrated by the aliens. It then finds its way into Straker’s office, and this is where the heart of the episode lies. Straker and Henderson are having one of their usual arguments. “Let’s get back to realities” says Henderson and immediately afterwards, somebody says “Cut and print”. The camera pulls back to reveal that SHADO HQ is nothing more than a film set and Straker is actually Howard Byrne, the leading actor. A dazed Straker exits onto the studio grounds and makes his way over to Theatre 7, where the rough-cut of his “show” is being screened. There then follows a series of clips from Identified and A Question of Priorities. This could be seen as a way of saving some money by recycling footage, but it’s a key part of the episode. 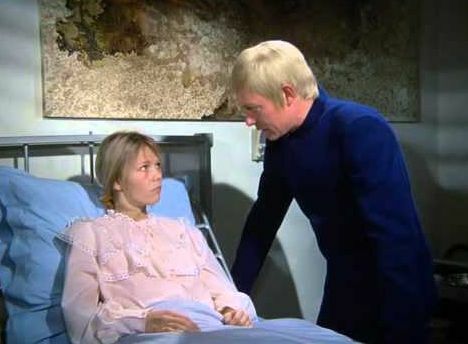 Straker is forced to watch the death of his son, whilst his co-star Mike (Michael Billington) leans over and tells him how it’ll make a great episode. One recurring theme of UFO is how emotionally damaged Straker is, from both the break-up of his marriage and the death of his son, so it’s heartbreaking to see him have to relive those moments again. Ed Bishop is wonderful here – he says very little, but you’re left in no doubt as to the impact these shots have. But even when he’s driven to the point of madness, the steel-trap of Straker’s mind still functions and he works out a way to get back to reality. He goes back into the office and repeats his argument with Henderson. As he begins to take control over the situation, things start to return to normal and, in effect, the fourth wall (which was shattered) now reforms, ensuring that he’s back where he belongs. It takes a certain amount of nerve to do a story like Mindbender, but it certainly pays off. There’s a danger inherent in showing us “behind the scenes” as the camera reveals to us just how flimsy and small the sets are – Skydiver, Moonbase control, etc. Of course, it’s also lovely to have this peek behind the scenes and understand a little about how the series was made. Possibly there might have been a feeling that UFO probably wouldn’t be renewed, so they might as well go for broke story-wise. Whatever the reason, I’m glad they did, as Mindbender not only works as a character piece for Straker, it also offers an ironic comment on the artifice of programme making. Wonderful stuff. It’s tempting to draw parallels between the final episodes of UFO and the final episodes of The Prisoner. 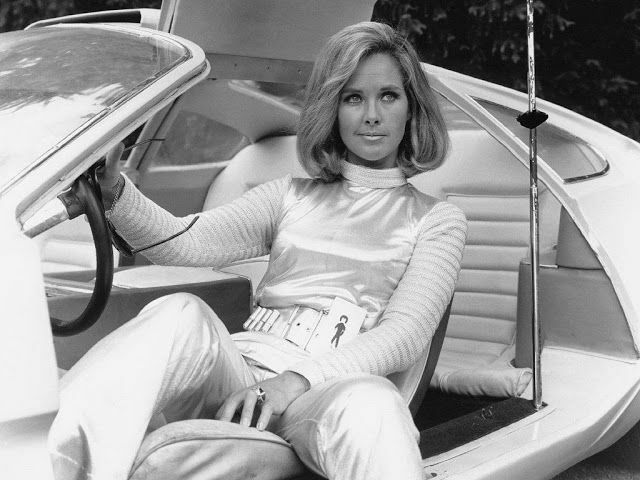 Although hopes were high at the time that another series of UFO would be made (eventually the concept of UFO series 2 mutated into Space 1999) there must have been some inkling that the series’ days were numbered. Is this the reason why we had episodes like Timelash and Mindbender, which both pushed the series format in ways we’d never seen before? This also happened on The Prisoner, where the final few episodes (The Girl Who Was Death, Fall Out) were very strange indeed. Whatever the reason, Timelash has one of the most arresting openings of any the UFO story. 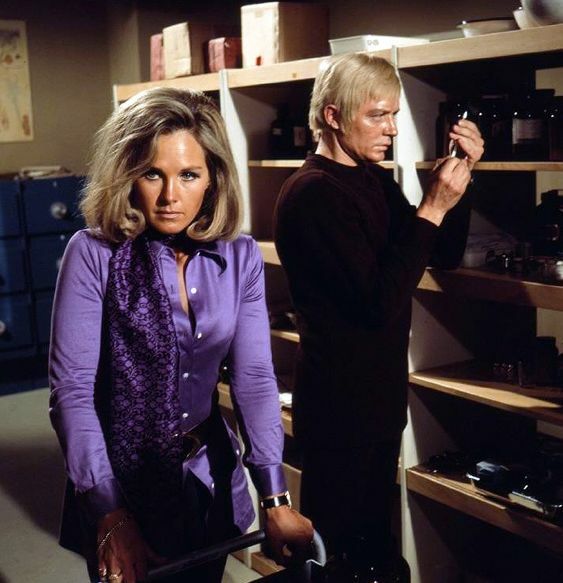 It seems to be a normal, humdrum day at SHADO HQ, but out of nowhere a disheveled Straker appears and starts smashing the equipment. He then beats up a dozen or so SHADO personnel (it’s amusing that Foster seems to be cowering the corner, unwilling to take a pasting!) before running onto the studio backlot. Foster and company eventually corner him, just as he discovers the unconscious form of Colonel Lake. Taken back to SHADO HQ, Straker is injected with a drug which starts to bring him back to normality and since we’ve now seen the conclusion, we rewind back to the start of the story. Straker and Lake had been returning to headquarters when they noticed a UFO on their tail. Attempts to raise the alarm with SHADO get no response. The reason why becomes obvious when they enter the grounds of the Harlington-Straker film studios. Somehow, the aliens have managed to time freeze the whole area. Every person is completely immobile and unresponsive (some lovely camera tricks here – a chair suspended in the air, smoke from a cigarette, etc) with Straker and Lake seemingly the only people not affected. Watching the two of them in action, had UFO gone to another series they could have formed a very impressive partnership. 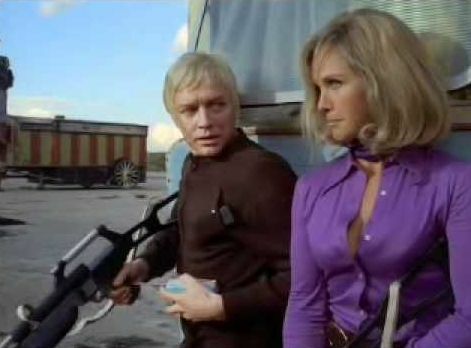 Ed Bishop and Wanda Ventham worked very well together and it’s a pity we didn’t get to see more stories with them paired up. As they explore, Lake notices that one person has moved. Turner (Patrick Allen) is a traitor who has sold out to the aliens. Straker and Lake tool up with some impressive hardware and hunt him down through the studio backlot. This is where the story takes on even more of a surreal edge, as Turner has the ability to move in time and therefore is able to stay a couple of steps ahead of them. He also has a nice line in mocking taunts as he attempts to pay Straker back for every slight, either real or imagined, he’s suffered over the years as one of SHADO’s foot-soldiers. And when Turner and Straker chase each other around the lot in children’s sports-cars you definitely know this isn’t a typical episode! Eventually Straker works out a way to stop Turner and also manages destroy the UFO (although this is where there’s a little lack of logic – if the aliens are so powerful that they can freeze time, why send only one UFO? In Reflections in the Water, also written by Terence Feely, they had a fleet of 25!). This niggle apart, everything ties up by the end of the episode as we understand exactly why Straker was smashing up the equipment at the start of the story. A complex, imaginative and ultimately satisfying tale, Timelash is a cracking episode. 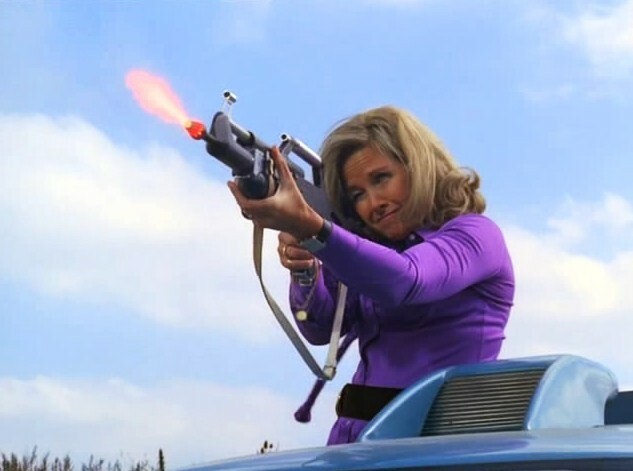 And Wanda Ventham looks absolutely gorgeous, which is the icing on the cake! It seems an unwritten law that every science fiction/fantasy series has to have a doppelganger episode – and Reflections in the Water is UFO’s contribution to this genre. But though it’s a decent run-around, there are some whacking plot holes which are difficult to ignore. When a freighter in the Mid-Atlantic is destroyed by an underwater UFO, Straker sends Skydiver to investigate. They discover the aliens have established a substantial underwater base (although why it’s underwater is a bit of a mystery). Straker and Foster fly out to investigate personally (which is something else that’s difficult to find entirely credible. Straker’s the head of SHADO, why does he need to endanger himself on a reconnaissance mission?). Anyway, Straker and Foster pop on some diving suits and go for a swim. While they can’t find a way into the dome on their first attempt, they are able to see inside and observe Lt Anderson (James Cosmo). The pair head back to SHADO HQ to interrogate Anderson, which gives us yet another example of how ruthless Straker is. He has no qualms in authorising Anderson to be injected with drugs in order to establish the truth and interestingly Anderson doesn’t argue about this too much. Even after the truth drug, Anderson continues to protest his innocence so Straker and Foster go back and manage to infiltrate the dome. Once inside, Straker and Foster split up and shortly afterwards Straker is attacked by Foster. But it’s not Foster, it’s a double! One of the main attractions of a doppelganger story is when they meet, but we never see it here. After Straker defeats the faux-Foster, the real Foster appears and is shown his duplicate. We linger a little too long on a shot of Foster looking at someone that clearly isn’t him, which makes you wonder why they didn’t use a little split screen filming to have the two of them on screen at the same time. We now come to the part of the episode which stretches credulity to breaking point. The aliens have recreated SHADO HQ (how?) and recruited look-alikes for all the main SHADO personnel (plastic surgery apparently). Although the aliens have clearly spent a packet on getting the likenesses spot on, they obviously couldn’t afford a voice coach, so we see the doubles practicing by miming to the real voices of the SHADO staff which have been recorded on tape. The aliens’ plan is to try and fool Moonbase into thinking this is the real SHADO HQ and then order them not to destroy the massed UFOs which are poised to attack. It’s clever that the aliens have somehow been able to sample the voices and produce exactly the words they need to say, but what would happen if Moonbase asked a question that wasn’t recorded? They’d be a little stuck. A whopping explosion destorys the dome, so there’s just the 25 or so UFOs to worry about. And via a load of stock footage (Interceptors, Moonbase rocket-launchers, Sky One) they are all dealt with. This is the last thing that’s difficult to swallow. We’ve seen SHADO struggle to stop one or two UFOs getting through in plenty of episodes so far, so could they really have shot down all 25? Although the story makes little sense, it’s still as watchable as most episodes in the series. It’s just that you have to disengage your critical facilities somewhat before starting. I’ve previously mentioned how a number of UFO stories have the same basic premise – the aliens take over a human being and force them to do their biding. It seemed to be a particularly popular story device during production block two, as we’ve seen it occur in The Man Who Came Back, Destruction and The Cat With Ten Lives. Is The Psychobombs any different from these and other stories? Well, one innovation is that there are three human agents, rather than the more normal one, so this allows several different threats to be carried out at once. And all three of the controlled humans are played by decent actors, so this is a plus point. A UFO lands in a deserted woodland and sends out a hypnotic signal. Three people answer the call – Linda Simmonds (Deborah Grant), Clem Mason (Mike Pratt) and Daniel Clark (David Collings). Clark is straight into the action and flags down Straker’s car. Given that the aliens have attempted to kill Straker before they miss a golden opportunity here. Instead, Clark knocks Straker unconscious and puts a note into his pocket. The note is an ultimatum – all SHADO operations must cease, otherwise Fairfield Tracker Station, Skydiver 3 and finally SHADO Control will be destroyed. Foster locates the girl and Straker orders that she be brought to SHADO HQ. A rather rash act, you might think – and it seems to have backfired after she escapes from custody and is poised to blow up the building. However, Sky 4 manages to destroy the UFO controlling Linda, though given the way previous stories have gone, I’ll leave you to decide if there’s a happy ending. As I’ve said, there’s nothing particularly original here, but the number of threats posed by different people is an intriguing twist. There’s also interest in spotting some faces that would become familiar television faces years later (Peter Blythe, Christopher Timothy and Oscar James, for example). Trivia fans may notice that the rather nice red dress worn by Deborah Grant is also worn by Susan Jameson in The Sound of Silence. It makes another appearance in the upcoming Timelash, so they certainly got their money’s worth from it! 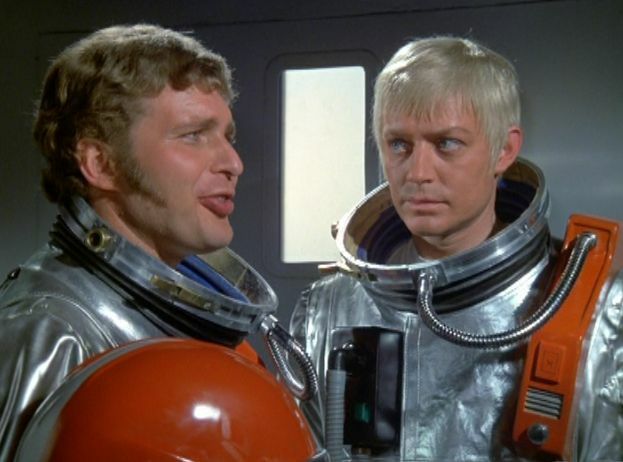 Craig Collins (Derren Nesbit) is one of SHADO’s top astronauts and a close friend of Ed Straker (they trained together as astronauts). After his ship is targeted during a UFO attack, which also damages SID, Collins is posted as missing, believed dead. However, by a miracle he’s somehow survived and several weeks later is rescued from a distant island. Amongst Collins’ various skills is an intimate knowledge of SID, so Straker assigns him to repair the computer. But as soon as he returns to Moonbase, others notice a change in his behavior – notably Colonel Grey, Paul Foster and Virginia Lake. Collins and Lake had been intimate, but Lake brings their relationship to an end. All three are sure there is a problem, but Straker isn’t convinced. Collins persuades Straker to join him on the SID repair mission, but once out in space he realises the others were right – Collins is under alien control and has orders to kill him! The Man Who Came Back is another cracking episode which is dominated by Derren Nesbit, who’s great value as the unstable Collins. Nesbit made a career out of playing somewhat manic characters in the various ITC series of the time, so his appeance is almost enough on its own for the viewer to guess how the story will pan out. True, if you examine the plot a little too closely then it doesn’t make much sense. Was Straker really the only person equipped to repair SID? And it was very convenient that Collins was able to nobble the only two people (Grey and Jackson) who knew for sure that something was wrong. Wouldn’t either of them have raised their concerns with Straker? But if we ignore these flaws, then there’s a lot to enjoy here, particularly the tense finale. The confrontation between Collins and Straker takes place when both are floating in space, close to SID, and director David Lane is able to ramp up the tension, even when the two of them are moving very slowly. As might be expected, this is another downbeat ending. Straker has no choice but to kill one of his oldest friends, which no doubt helps to crush a little more humanity from his soul. On a more frivolous note, Colonel Lake looks very fetching in the Moonbase garb. And the sight of the injured SID, spinning around in space, is another memorable moment. We’ve seen a few episodes previously with characters being controlled by the aliens, but there’s enough in The Man Who Came Back to make it stand up in its own right, and not feel too much like a retread.